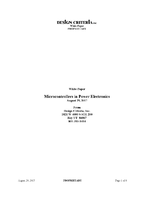 Polypropylene Film Capacitors target UPS systems. 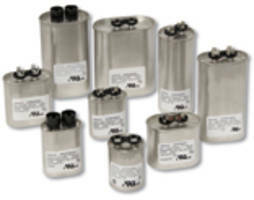 Available in round or oval oil-filled aluminum cases, Polypropylene Film Capacitors offer voltage ratings from 240–660 Vac and capacitances from 10–120 Âµf. 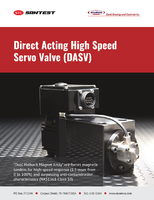 Many ratings are available with discharge resistors and mounting studs. Capacitors are suitable for uninterruptible power supplies usedÂ in data centers, high-density power zones, buildings, and industrial processes. 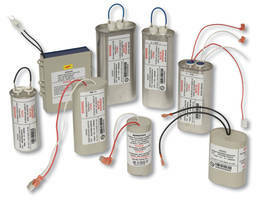 New Bedford, MA -- Aerovox Corp. has released a line of UPS polypropylene film capacitors especially designed and tested to meet the needs of operation critical applications. The capacitors are used in uninterruptible power supplies (UPS) in data centers, high density power zones, buildings and industrial processes. Capacitor reliability and long life essential to UPS systems is accomplished by Aerovox’s unique testing protocol. After a standard final electrical test, a high voltage five-minute burn-in/aging test is performed on all Aerovox UPS capacitors, followed by five high current discharge pulses. Developed specifically for UPS capacitors, this testing effectively screens out the potential for early life failures. Aerovox’s UPS capacitors are available in round or oval oil-filled aluminum cases with voltage ratings from 240 to 660 VAC and capacitances from 10 to 120 μf. Many ratings are available with discharge resistors and mounting studs. For more information about Aerovox’s UPS capacitors, email sales1@aerovox.com or call 508-910-3500. High Voltage Film Capacitors meet ITAR standards. PFC Capacitors meet IEC and CE compliance standards. Custom Pulse Capacitor offer extended operating life.